[R]equired reading ... Equally important to its subject matter, the book is a master class in how to think and why. Jenkins uses her readable book to advocate for thinking both critically and in great depth as a form of self-protection and self-advocacy. Tolerate no one admonishing you for overthinking love, she advises. Love is an “extreme sport,” and we need parachutes. In so arguing, she empowers her readers in regard to not just their love lives but also their whole lives. The author attacks heteronormativity, gendering, moralizing, and the deeply held cultural assumptions surrounding monogamy and love’s other presumed trappings ... and blends thorough research with personal experiences to present a readable and highly informative book. [A] deeply thoughtful, incisive, and engaging exploration of the nature of romantic love. Jenkins identifies the central question of the book as: How can love be both biological and a social construct? To find answers, she stretches far beyond her field of philosophy to explore perspectives from psychology, anthropology, literature, biology, neuroscience, evolutionary science, feminist studies and more. ... Throughout the book, Jenkins challenges one piece of conventional wisdom after another. There are two observations in Jenkins’ book that are desperately important for discussions of minority sexuality. The first is that biological and social understandings of love, bonding and sexuality don’t have to be at war ... There’s far more value, as Jenkins writes, in locating “the hidden seams between love’s biological machinery and its ideological contours,” and figuring out how all the parts fit together. The second important observation is that queer folk are not forced to either embrace romantic love, with all its heterosexist, mononormative, white-picket-fence baggage, or jettison it completely ... We can guide love’s social reality onto a more equal, expressive and inclusive path, making room for queer love, non-monogamous love, asexual love and everything else demanded by our complex biology. Love, Jenkins wants to say, is salvageable. Jenkins walks the reader through theories about romantic love past and present, drawing from classical philosophy, science and literature. This might sound dry and academic, but Jenkins adds fun with pop culture references and vivid images. When new ideas threaten what we hold as truth, it is sometimes easier to stay away from them altogether ... Vancouver-based writer and philosopher Carrie Jenkins sets out to tell us that love may not be what we think it is – a frightening notion at first, but Jenkins means no harm. In fact, this book is a testament to love. [A]n exceptionally clear and easily readable account of the current research into romantic love and ideas for how we might think differently about it. Jenkins ... shakes up the status quo from the very start of this philosophical inquiry into the nature of love ... her vulnerable voice is charming and relatable. In characteristic fashion, Jenkins rejects the aversion to reflecting on love for fear of destroying it, professing to be "more worried about the tangible dangers of underthinking than the putative dangers of overthinking." And so she proceeds to examine how experts, including philosophers — from Plato to Nietzsche to Russell, and to her contemporaries, like the University of Miami’s Berit Brogaard — have defined romantic love, and works to break down common assumptions about it. Some of those, like Nietzsche’s assertion that a woman "wants to be taken and accepted as a possession," are easier to refute than others, like the idea that "if you’re not in romantic love, or at least looking for it, then you’re doing life wrong." [O]ne of the most wonderful books I have read in a very long time. It is one of those rare books by a philosopher that is written so clearly, and with such academic and intellectual humility, that I believe anyone could read it and walk away a little wiser, able to see the most precious parts of their lives in brand-new ways ... Her quest for understanding the nature of love is deeply personal, and it's her vulnerability and authenticity that makes her account of love so moving. It is beautifully written, thoughtful, hopeful, and practical in the way that great, lasting philosophy needs to be. Profoundly accessible yet intensely philosophical, What Love Is and What It Could Be is philosophy at its very best. [I]t's not surprising that given her job and her polyamorous relationships, she has a few questions about love: Must love be monogamous; Must it be romantic? And that's just for starters. This is a thoughtful book, and Jenkins writes simply about a subject on all our minds. Having deftly reasoned her way through the social-constructivist perspective (ie, romantic love is a result of cultural imperatives) and the scientific POV (ie, romantic love is a result of evolutionary imperatives), she posits romantic love as “ancient biological machinery embodying a modern social role” ... The author suggests that by moving away from narrowly-defined religious or cultural expectations of romantic love to the understanding that people won’t always be ‘reading from the same script’, we can be freer, happier, and more in touch with our humanity. Jenkins’ essential message - “think about love for yourself” – is the best takeaway here, as this is a book that offers readers much to ponder. Carrie Jenkins' new book is a model for what public philosophy can be. 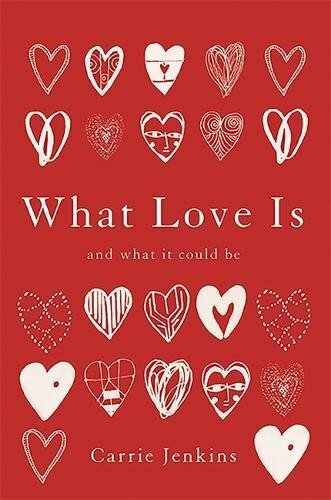 Beautifully written, thoughtful, and compellingly and carefully argued, What Love Is: And What it Could Be ... invites us to think openly and critically about romantic love: what it is, what it could be, and why it is crucial for us to ask these questions and come to our own answers. Jenkins gets at something I think we all know deep inside but heavily resist ... [she] push[es] for a wholesale remodelling of what a heart is for. I started reading the book in March and immediately adored it… not because I agreed with everything, but because it's so interesting to witness someone applying their super analytic, logic-based brain skills ... to something squishy like love and relationship structures. ... The book is dense and meaty and gave me some great tools to help me think through my own concepts of love ... reading how an intelligent woman thinks through the issue was HUGELY useful for me. It's worth noting that while yes: the book is a philosophy book, it's written in language that's accessible enough that you don't need to be an academic to get through it. Jenkins references everyone from Plato to Simone de Beauvoir, from bell hooks to Dan Savage. The book ends with a massive rallying cry — not that everyone should be polyamorous, but that everyone should be able to choose their own adventure through love. ... I am so, SO down.